Play on legendary courses, including St. Andrews, Pebble Beach, Spy Glass, and more! Save $10 on League Fees if you have a child participating in a High Velocity clinic or league! The indoor golf house leagues accommodate golfers of all skill levels: Men’s, Ladies, Juniors, Couples and Seniors league. Seasons run 10 weeks long on an 18 hole format. Flexible tee times, play any day and time within each week! Session winner will receive a free entry into the Winter 1 Golf League starting November 2019. A $150 value . High Velocity Sports can also help you setup your own corporate, neighborhood, church or club league. Please contact us at 734-487-7678 for further details. 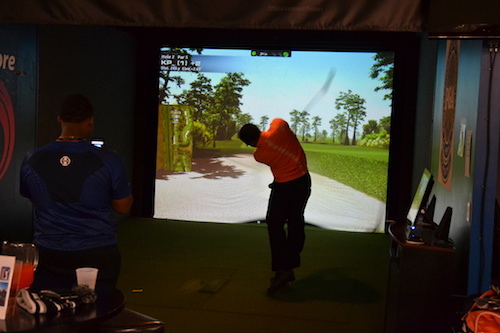 The Golf Simulator at High Velocity is open for rentals to play golf’s most famous courses. Reserve your tee time today! Call to schedule tee times – $30 per hour. All reservations must be booked with a valid credit card (Master/Visa/Discover). Plan on booking one hour for 18 holes of golf per person. The new HVS Golf Clinics will be taught by staff of the Craig Piscopink Golf Academy. 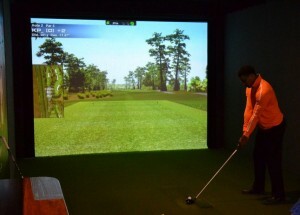 Classes will take place on the HVS Golf Simulators. Classes are limited to 6 participants to help ensure plenty of individual attention. The HVS Golf Simulators will provide an “on the course” feel to the class, while providing instant analysis on the participants swing. Participants can bring their own clubs or take advantage of the limited number we have to borrow. Students will learn the basic fundamentals of golf; grip, swing, stance, etc. Both adults or youth can take part in the class, instruction will be based on level of experience for each individual. Please email us at piscopinkacademy@gmail.com to sign up or ask any questions you may have. Minimum of 2, maximum of 6 per session. If dates and times do not work, we also offer custom five week sessions for your own group of golfers, as well as private lessons. 5 week sessions. Each session will be one hour of instruction per week.